The Sunda Slow Loris (Nycticebus coucang) or Greater Slow Loris is a strepsirrhine primate and a species of slow loris native to the Indonesia, Malasia, southern Thailand and Singapore. 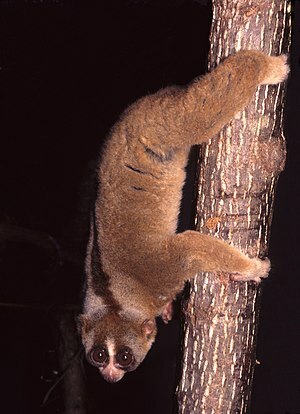 The Sunda Slow Loris is nocturnal and arboreal, occurring in both evergreen and deciduous forests. It prefers rainforests with continuous dense canopies, and has an extremely low metabolic rate compared to other mammals of their size. The species is listed as "Vulnerable" on the IUCN Red List, and is threatened with extinction due to a growing demand in the exotic pet trade, and has become one of the most abundant primate species on sale at Indonesian pet markets. Its teeth are often pulled out before being sold as pets which can result in infection and/or death, this process makes reintroduction to the wild impossible. It also suffers from habitat loss, which has been severe in the areas it is found in. Please note that the above slideshow is automatically created by searching Flickr and does not contain manually curated images. Hence, it is likely that some images may not be of Nycticebus coucang. This page was last modified on 7 February 2011, at 15:26.